Prices start at $.0180 per square inch for general meandering quilting. Prices increase with complexity of design, thread changes & custom designs. Minimum $45.00. Batting & Backing NOT included. Length of quilt X width of quilt = total square inches. Total square inches X $.0180 = Cost . Example: Quilt measures 60" by 70" = 4200 sq. inches. Bindings ~ Includes cutting, piecing, pressing, machine stitched to the back, mitered corners, machine decorative stitched to the front. Customer provides 1 yard fabric. $ .20 per linear inch. Bindings ~ Includes cutting, piecing, pressing, machine stitched to the front, mitered corners, hand stitched to the back. Customer provides 1 yard fabric. $ .30 per linear inch. 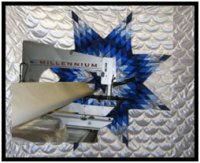 When choosing backings, it is best to choose "quality" fabric comparative to your quilt top. The nice thing about one-piece wide backings is that there are no piecing requirements. Bed sheets for quilt backs are not recommended for quality quilting. If you choose a regular width fabric(42-44 inches) for your quilt back, be sure to remove the salvages before making your seam. (this should always be done before beginning any type of sewing.) The salvages have a very tight weave and this causes the backing to pull toward the seam making the backing pull toward the seam while loading it on our machines. Also a little longer than usual stitch helps avoid this. When seaming your backing it is recommended to use two vertical seams rather than one, a full width of fabric in the middle and equal widths on each side to make your back the correct width. Your quilt back should be six inches wider than your top and one inch longer per 12 inches of quilt top (example, for a 72 inch long top you should have your quilt back 6 inches longer- 78 inches) The gathering-in during quilting will vary depending on what type of batting is chosen. The medium to high loft polyester will gather in more material than the low loft poly or cotton batting. It is much better to be safe with a couple extra inches of backing for good measure than to get a call from your quilter that the backing does not reach! We hope this will give you a little help on choosing and preparing your quilt back. The Christian life is one of faith, not mere feeling. Scripture says "The just shall live by faith" (Romans 1:17).